In this photo taken by surveillance planes and released May 15, 2014 by the Philippine Department of Foreign Affairs, a Chinese vessel, top center, is used to expand structures and land on the Johnson Reef, called Mabini by the Philippines and Chigua by China, at the Spratly Islands at South China Sea, Philippines. MANILA — Philippine officials say the military has recently spotted what it calls "reclamation activity" by China at several reefs it claims in the South China Sea. China has long-contended its “indisputable sovereignty” over practically the entire sea based on historical facts and maps. A Philippine Supreme Court justice is refuting China’s maps as the basis for its claims to about 90 percent of the South China Sea. Associate Justice Antonio Carpio said they held little weight. “China points to ancient Chinese maps as historical facts to claim the islands, rocks, reefs and waters within its nine-dash line claim in the South China Sea. At the outset, we must stress that under international law a map per se does not constitute a territorial title or legal document to establish territorial rights.” said Carpio. Carpio recommended that the Philippine government enter into international arbitration to question China’s U-shaped claim to the waters, as demarcated by nine-dashes. Carpio has been holding a series of lectures on the legal basis of the maritime claims of the Philippines and China in the South China Sea under the United Nations Convention on the Law of the Sea. During a talk in Manila this week, Carpio highlighted more than a dozen maps created by both Chinese and foreign cartographers from 1136 through the early 1930’s. “All these ancient maps show that since the first Chinese maps appeared the southern-most territory of China has always been Hainan Island," said Carpio. 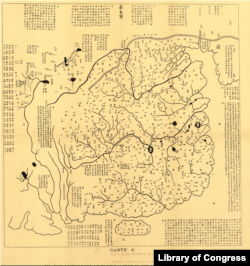 This map of China is from what is believed to be a stone rubbing from 1136 AD. Philippine Supreme Court Assoc. Justice Antonio Carpio used it as part of his presentation to show that until the early 1900's China consistently mapped out its southern-most border as Hainan Island in the South China Sea. Francois-Xavier Bonnet is a geographer with the Bangkok-based Research Institute on Contemporary Southeast Asia. He said by the early 1900’s, China had surveyed and included on its maps the Paracel Islands in the South China Sea, which then became the southern-most border. In the early 1930’s China countered a French claim of the Spratly Islands and then included them in a 1935 map. This became the basis for the nine-dash demarcation of 1947 that is now the official map. “For maps in international law, most of the maps are just information. In fact, they give information for one period and it’s not a legal document,” he said. The Philippines says China has intruded into its 370-kilometer exclusive economic zone numerous times, while China has maintained “indisputable sovereignty” over most of the sea. Brunei, Malaysia, Taiwan and Vietnam also have claims in the sea, which is rich in marine life, is believed to have major hydrocarbon reserves and is a heavily traveled trade route. In late March the Philippines submitted supporting documents for its arbitration case to a panel with the International Tribunal for the Law of the Sea. It calls China’s nine-dash line claim excessive. The Permanent Court of Arbitration last month gave China until December 15 to submit countering materials, but China again reiterated its rejection of the arbitration. Myron Nordquist of the Center for Oceans Law and Policy at the University of Virginia said maps and additional data should be seen as supporting materials to claims. “You have to do more than just make a claim, you have to demonstrate effective occupation and they haven’t done that,” he said. Nordquist said a claimant country needed to have power or authority over the territory and it could not be done over another country’s protests. He sid China’s reclamation activity in Johnson South Reef did not demonstrate this because the Philippines filed a diplomatic protest. Manila is monitoring three other reefs in the Spratlys where it suspects Beijing is planning reclamation areas. Officials say they plan to file protests if they find reclamation work is being done. “It may generate a claim on historical grounds to islands in the South China Sea and submit maps that it believes add to its case, but the nine-dash line can’t be reconciled with the U.N. Law of the Sea if that interpretation is that it’s an enclosure of territorial waters,” said Graham. But Nordquist said despite the minimal impact of using maps to reinforce claims, China was in a stronger legal position than it appeared. He said China could reject arbitration because in 2006, under UNCLOS, it opted out of letting any third party determine territory or maritime delineations. And this would mean that an award in favor of the Philippines would be hard to enforce.